Here are a few examples of lovely animals I have had the pleasure of painting in the last year. If you’re interested in getting your own, unique pawtrait – get in touch and I’ll give you a quote! 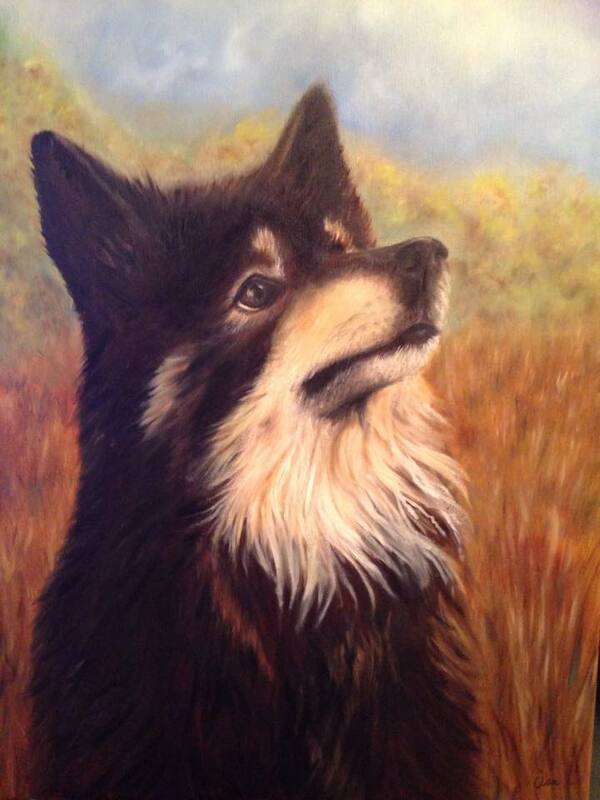 This is Loki the Finnish lapphund – as the name suggests he is a very cheeky and playful character and was a joy to paint! This is a 24×18 inch piece in oil. This is Monty the Labrador. He is a very friendly chap with the happiest tail in the world. 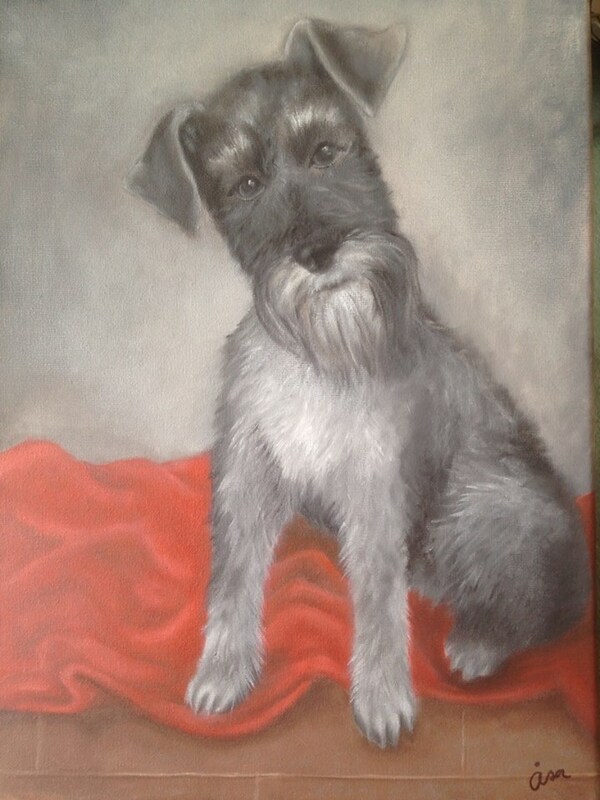 He was very difficult to paint as he has so many shades of black throughout his lovely, shiny fur, and at 24×18 inches this was the largest canvas I’d done. This is Tosh, a handsome gun dog who spends most of his time in a pub in West Berkshire. 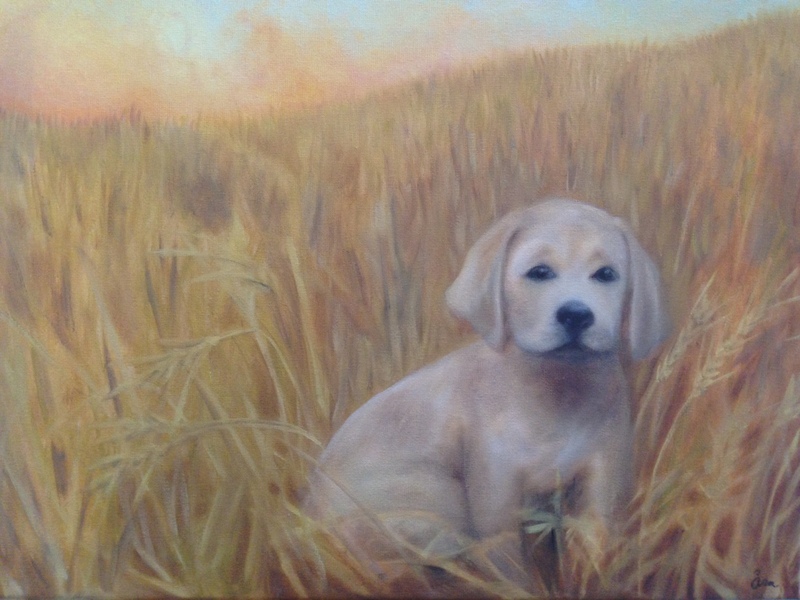 The pawtrait of Tosh was a wedding gift for his parents. 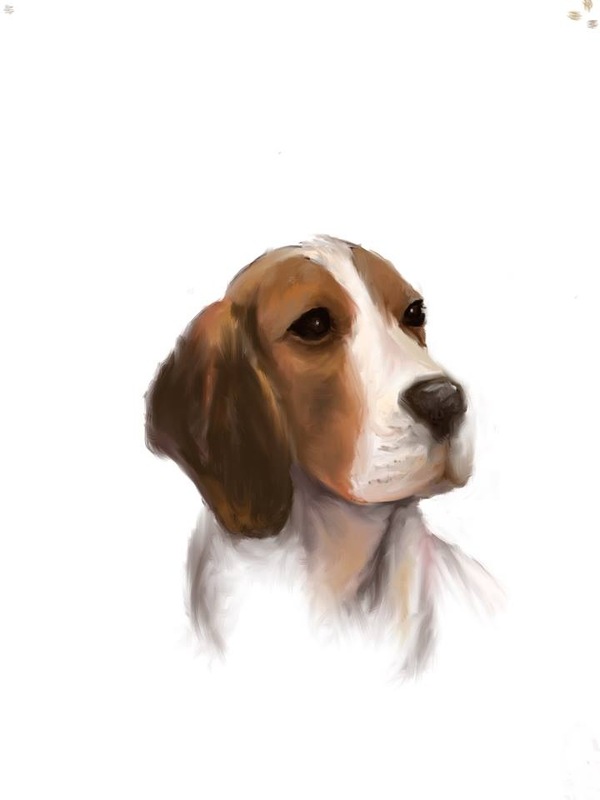 The pawtrait of Pepsi the Beagle was a first effort using the iPad (InspirePro Free). I’d like to say it’s work in progress, but I think it’s more likely that I’ll make an entirely new attempt. This little proud lady is called Lily and belongs to a gorgeous blonde (not me!). I loved painting this, because there were so many interesting changes in fur texture and shade. We all know the scenario. We walk past a charity collection stall, get stopped by an enthusiastic fundraiser with a clipboard and a well-rehearsed pitch. We get the all-too-familiar feeling of guilt as we make up some lame excuse as to why we choose not to give. Whatever the excuse, and whether or not it’s valid, the truth is that most of us walk away feeling uncomfortable. Our guilt buttons have been pressed, and we have to try to switch to “callous mode”. When we DO give, of course some of us willingly give because we genuinely connect with the cause, but many of us fall into the Guilt Trap – and give only because we feel emotionally blackmailed into doing so. This results in an uneasy feeling, not dissimilar to how we feel when we’ve just bought a pair of shoes that were way too expensive – but the shop assistant assured us we look great in them. Charity marketing should be no different to commercial marketing. When faced with charity, we employ exactly the same decision making process as we do when we consider purchasing a product or a service. We trust in facts and figures, but when it comes to signing the dotted line we also tune into what some people call the gut feeling. We listen to our emotional response. Our job as marketers is to ensure that this emotional response is aligned with the individual’s values. So how do we do that? Well – first of all, let’s not assume that everyone is our target market. Fundraising in the street is really a bit like spam email. We bombard every single person with our message, not knowing whether or not they are likely to be interested. A small percentage will respond, whereas the vast majority will turn away – and made to feel guilty for it. If we on the other hand engage with people in a select community, where we know there is already a heartfelt interest in a particular cause, we can create messaging and activities that resonate with that audience. This way we generate higher response rates, which give us improved ROI, and we are more likely to gain advocates who in turn will share the cause with their own networks. Secondly, we need to also recognise that it’s not all about the money. By guilt-trapping donors, we may get a small, single donation or a sign-up for a monthly direct debit which is soon cancelled. In addition, the person may end up with a negative connotation of the charity. If we instead focus our efforts on winning donors who genuinely love what the organisation stands for, the charity can see long-term benefits which spread like circles on water. As marketers, we really need to wake up and respond to modern human behaviour. As cold as it may sound, charities need more than just pictures of crying children and endangered animals. The new generation has become immune to many of these visuals – because they are constantly bombarded with them and simply cannot respond to them all. But there will be that one or two causes, that speaks to them through the noise; that’s where the sweet spot is. By implementing this marketing shift, charities will of course also stop wasting time and money on ineffective fundraising. And that’s surely a winner in anyone’s book!